Dahl was a Swedish painter who studied under Ehrenstrahl (see 405909) before coming to England in 1689. He was patronised by Queen Anne, painting some naval portraits for her (subsequently given by George IV to the Greenwich Hospital and now in the Maritime Museum) as well as the three works still in the Royal Collection. This ambitious equestrian full-length was painted for the Queen's Guard Chamber at Windsor Castle, where it hung until the 1870s. 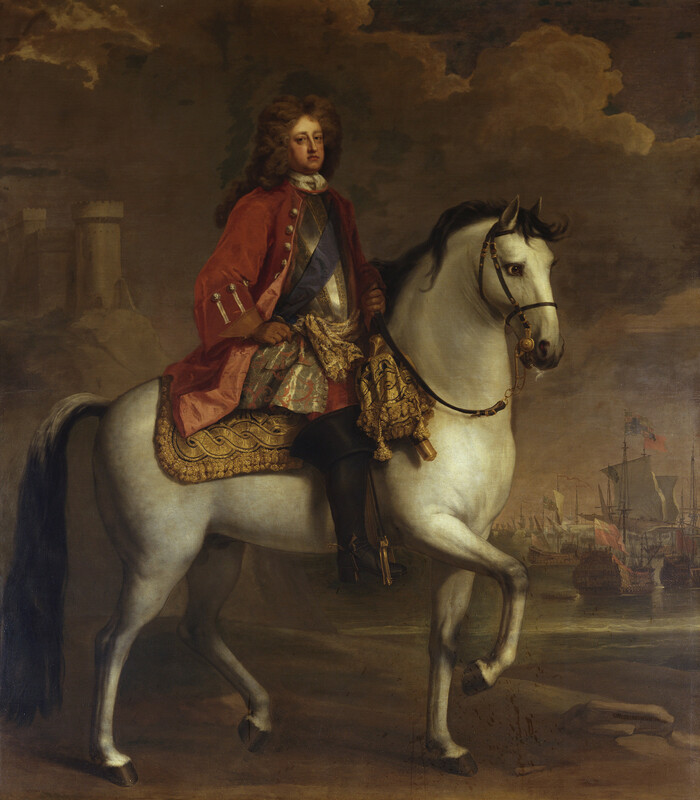 It shows Queen Anne's husband, Prince George of Denmark, as Lord High Admiral mounted on a grey charger, wearing a red velvet coat over a breastplate with the riband of the Garter. The defence of the realm is suggested by a fort on a hillside on one side and the fleet on the other. It is instructive to compare this image with its equivalent from the previous reign - Kneller's 'William III' (OM 337, 403986) of 1701: Dahl has dispensed with Kneller's allegorical figures, instead presenting his meaning in a matter-of-fact way, which was to become the hall-mark of English eighteenth-century imagery.